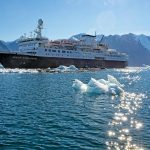 While the Arctic may conjure up images of Santa Claus, the reality has its own magical charm, and a 16-night expedition cruise offered by Adventure Canada takes in the icebergs, dramatic fjords and stunning glaciers of the Arctic’s Northwest Passage, while offering a glimpse into the lives of the Innuits who call the region their home. Bookings for the journey made before January 19, 2019, will attract a 10 per cent discount, while solo travellers can book without paying a solo supplement, subject to availability. Guests booking through Cruise Traveller will also receive two, free hotel stays either side of the cruise, at Toronto and Calgary. 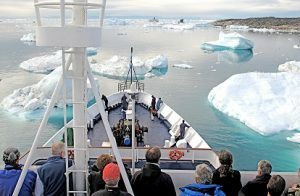 Departing August 21, 2020, the cruise will sail from Greenland, with its quaint villages, dramatic fjords and glaciers, to Canada’s northern shores, travelling through the famed Northwest Passage. Linking the Pacific and Atlantic Oceans, the Northwest Passage is only navigable by ships for a few months a year after the peak of summer. Many 19th century European explorers tried to traverse the passage as a possible trade route to Asia, often with journeys ending in disaster. Today, the Northwest Passage is accessible by ice-strengthened expedition ships – but the icy waters still retain their mystic charm. Guests will travel onboard the comfortable Ocean Endeavour and enjoy many Zodiac shore visits and excursions which will take them close to wildlife and provide an immersive insight into the traditional Inuit culture—including a visit to Canada’s northernmost community. Other highlights of the cruise include crossing the Arctic Circle, cruising along the icebergs at Ilulissat Icefjord – a world heritage site, visiting the historic remains of the Franklin Expedition, seeing polar bears, seabirds, seals and whales in their natural habitats, and visiting Devon Island – which, at over 50,000 square kilometres, is the largest uninhabited island on earth, and home to many geological and natural features. Including shore excursions, charter flights between Canada and Greenland and an expedition parka to keep, the 16-night ‘Into the Northwest Passage’ cruise is available from US$15,830 per person, twin-share, including the 10 per cent discount if booked by January 19, 2019. Alternatively, solo travellers can book without paying a solo supplement, with fares from $17,290 – subject to availability, and not available in conjunction with the early bird discount. A night in Toronto pre-cruise and a night-post-cruise in Calgary are also included. Flights from Australia are additional.